I have been teaching art for many years, and I have noticed that many people seem to have difficulties with colour mixing and in understanding how to use colour well. The initial problem that every painter encounters is trying to decide which colours to buy from the huge ranges on offer, to enable them to mix the widest range of colours. Some opt to buy lots of ready mixed colours and just work with those. The trouble with this is that apart from the expense, paintings made with ready mixed colours tend to lack unity, harmony and subtlety. Pre - mixed colours are often rather crude and unsubtle and in relying on them, no real control or understanding of colour is gained by the artist. Most people find working with colour difficult either because they have never been taught colour theory and mixing or if they have, they were taught the old 'primary' mixing system using three primary colours - red, yellow and blue to mix three 'secondary' colours - violet, green and orange. Despite the pioneering work of people such as Michael Wilcox, founder of 'The School of Colour' and author of 'Blue and Yellow Don't Make Green', the old primary system persists, causing frustration and confusion for painters in every field. Even some of the newest painting books still show the six - section colour wheel and instruct that 'red and blue make violet; yellow and blue make green; and red and yellow make orange'. They don't. Above is a more accurate and helpful colour wheel based on what is sometimes called the 'Dual-Primary System' which is formed using six basic colours instead of three - a greeny blue and a violety blue; an orangey red and and violety red; a greeny yellow and an orangey yellow. When the colours are arranged in a circle or 'colour wheel' the complementary colours are found opposite each other - oranges and blues; greens and reds; violets and yellows. These complementary 'pairs' of colours are very important in painting and can be used to create many different effects. 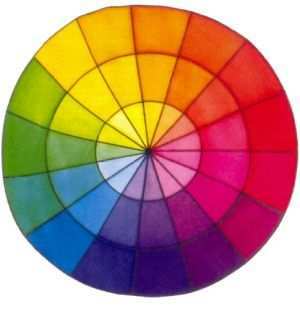 Tints of the colours can be made by adding water or diffusing medium to the colour (colours become paler towards the centre of the wheel). So why doesn't the old primary system work? It says you need a red, a blue and a yellow for mixing secondary colours. But which red, blue and yellow? There are so many to choose from and very different results are produced depending on which reds, yellows and blues you work with. For instance, a magenta red mixed with an ultramarine blue will produce a range of bright violets. But a bright scarlet red mixed with a bright turquoise blue will not make violets at all, only browns and greys! Ultramarine blue mixed with orangey yellow makes dull greens, whereas turquoise blue mixed with lemon yellow makes bright greens. Colour mixing can be very confusing and is often a very hit and miss affair! Each colour has a bias towards one end of the spectrum or the other. An ultramarine blue, for instance, is a violety blue - it tends towards the violet end of the spectrum. A turquoise blue is a greeny blue and is closer to green in the spectrum. An ultramarine blue has a bias towards violet and is therefore good for mixing violets, whereas a turquoise blue has a tendency towards green and is therefore better for mixing bright greens. It's the same with the reds. Each red has a bias either towards orange or violet. Likewise, every yellow is either a greeny yellow or an orangey yellow. need to mix as few colours as possible to get the colour you want. Some people find it very difficult initially to distinguish between each of the two types of red, yellow and blue. They can see that they are different but cannot see the 'hidden' colour in each. Blues seem to cause most problems, perhaps because the human eye is least sensitive to blue and most sensitive to red. I think that the more you work with colour, the easier it becomes to differentiate the colour bias in each and analyse the constituents of any colour you see and so be able to mix it confidently. If you want to mute or darken a colour, don't use black which destroys the character of the colour - use the complementary colour, opposite it on the colour wheel. Complementary pairs are used to mix ranges of neutral colours - browns, greys and blacks. With practise, you will gain complete control of colour, being able to mix any colour you want immediately, without wasting paint or expensive dyes and making colour work for you.